This project is a special thing to Craig and functions like a summation of where he’s been in his pre-millennium times and where he is heading. 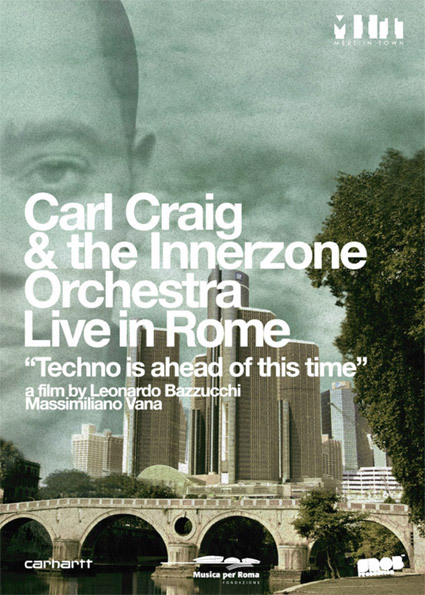 Last year the Techno legend played a remarkable Innerzone Orchestra concert in Romes Auditorium Parco della Musica, where he mixed Techno, Classic and Jazz into one great sonic wave. Now a DVD takes a close look to this unique show and gains an insight. All footage is commented on and accompanied by exclusive interviews with all band members, shooted during the week the Orchestra spent in Rome for the rehearsals of this extraordinary happening. Thats why the DVD, made in cooperation with Carhartt, is not just an ordinary concert documentation. It is also a close look into the thoughts and visions of Carl Craig and his bandsman. An impressive document that presents the last improvements in the field of mixing and reinterpretation of different music genres in the sign of Electronic and Techno approaches. Available soon in all Carhartt Stores.